Mr Jim Jolly, R.A. from Cleator Moor, Cumbria passed away on Saturday 25 April 2009 at the age of 85. Jim was originally from southern England and during WW2 served firstly in the Home Guard and then in the Royal Artillery. He will be missed by his dear wife Mary, children, grandchildren, great grandchildren, and many friends. Jim took part in the Normandy Landings and for several years until 6 June 2008, Jim also served as Branch Secretary of the West Cumbria Branch of the Normandy Veterans Association (Branch No 51). 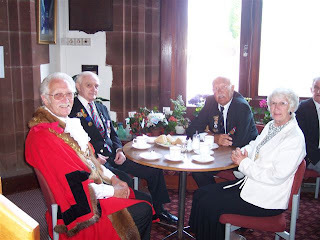 In the above photograph taken after the Branch Standard had been laid up for the last time Jim can be seen talking with Councillor Mr Keith Hitchen (Mayor of Copeland), Mrs Freida Hitchen (Mayoress) and Mr Roy Rogers, a former N.V.A. Branch Standard Bearer. 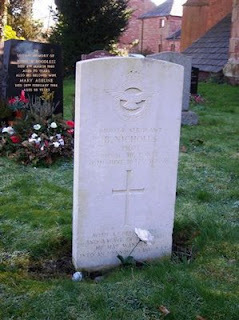 Flight Sergeant Benet Nicholls, R.A.F., Service No 610074, died on 26 June 1942 during a training flight from Crosby-on-Eden Airfield near Carlisle, Cumberland (now Cumbria). The plane crashed on Dent Fell, above Black How Farm, Cleator in West Cumberland. He was flying a single-seater Mk I Hawker Hurricane aircraft (Serial No P2877). 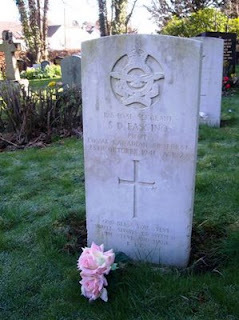 At the time of his death Sergeant Nicholls was 28 years old. He was laid to rest in the Churchyard of Our Lady and St Wilfred Roman Catholic Church, Warwick Bridge, Carlisle. This is about 2 miles from the Airfield at Crosby-on-Eden. On 26 June 1942 Benet Nicholls left the earthly realm for the last time and passed into an unknown land. On 28 October 1941 Sergeant (Pilot) Stephen D. Fassino, Service Number R/84031, an American serving with the Royal Canadian Air Force was killed when his plane crashed during a training flight near Carlisle, Cumberland (now Cumbria). Steve Fassino was 27 years old when he lost his life. He was laid to rest in the Churchyard of Our Lady and St Wilfred Roman Catholic Church, Warwick Bridge, Carlisle. He is an American who will always be with us in Britain. 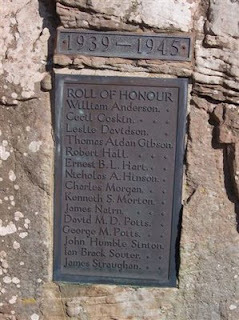 The above photographs of the War Memorial at Bamburgh, Northumberland were taken during a visit to the village and the castle. 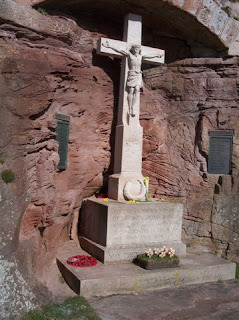 It is situated in a cutting beneath the landward side of Bamburgh Castle. This is the village of the Victorian heroine Grace Darling, who is buried in the local churchyard.